having delved into this particular topic myself in the past, I was eager to read Rita Steblin's article entitled "Who was Beethoven's 'Elise'? A new solution to the mystery" in the last issue of The Musical Times. My great expectations were disappointed, however, when I had to realise that the article has almost nothing to do with Beethoven's "Elise", consisting as it does solely of a biography of Elise Barensfeld of somewhat wearisome length. None of the scans of entries of Chotek's diary and charred police documents presented by Steblin in her article has anything at all to do with Beethoven's "Elise"; they simply serve the obvious purpose of distracting the reader from the fact that the article does not deal with the identification of the latter at all. Steblin provides absolutely no proof that Elise Barensfeld was Beethoven's "Elise", and the gap in the chain of evidence from which her hypothesis already suffered when in 2012 she presented it in the German press still yawns. Mälzel's address in Vienna is not "a key to the solution", and there is no proof that "Therese Malfatti […] knew Elise Barensfeld", let alone "surely". That Therese Malfatti "perhaps[sic] even gave Elise piano lessons", is an unproven and in addition irrelevant theory. Steblin's total lack of documentary evidence culminates in the curious question: "Was my candidate the unknown dedicatee of Beethoven's piano piece?" There is in fact no trace of a "solution to the mystery" to be found in the whole article. Steblin's faulty epistemology is already apparent in the title of her article. There are no "new solutions" of mysteries; there are new hypotheses — and one correct solution. By referring to "previous theories about Elise's identity", Steblin shows that she is aware of the traditional terminology, at the same time upgrading her hypothesis to a theory. In the new scholarly concept she seems to have established, however, every new theory automatically becomes a "solution" on its presentation by Dr. Steblin. In a lecture entitled "Beethovens Elise - ein Wunderkind aus Regensburg" (‘Beethoven's Elise - a child prodigy from Ratisbon’), delivered in that city on 15 November 2012, she was already presenting her hypothesis not just as a theory, but as a fact. In her article about Johann Nepomuk Mälzel in the Festschrift for David Hiley (Regensburger Studien zur Musikgeschichte 10, Tutzing: Schneider 2013) she referred to Elise Barensfeld as "most likely Beethoven's Elise". Such a sensationalistic procedure is not only embarrassing, but damages the reputation of historical musicology in general. Steblin is widely known for presenting a mere hypothesis as a solution of a mystery: her "solution" of the identity of Beethoven's "Immortal Beloved" has never been proved beyond doubt and depends on circumstantial evidence, presumption and wishful thinking. In an essay titled "Maria Eva Hummel. A Postscript", published in July 2013, I presented my own hypothesis concerning the identity of Beethoven's "Elise". Neither Klaus Martin Kopitz nor Steblin was able to accept that the name "Elisabeth" and a woman's personal acquaintance with Beethoven do not together suffice to identify her as "Beethoven's Elise". In my essay I pointed out that the identification of "Elise" stands and falls with the person's direct connection to the lost autograph of the Bagatelle WoO 59, last seen in Munich. Up to now only two women named Elise have been shown to have had such a close connection: Elise Schachner (née Wendling), the wife of the autograph's owner Josef Rudolf Schachner, and Schachner's daughter Elise Schachner. 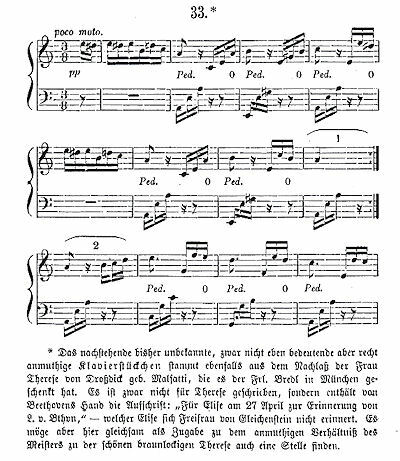 I therefore suggested that the dedication "Für Elise" on the autograph was not written by Beethoven at all, and that the composer wrote only the words "am 27 April  zur Erinnerung von L. v. Bthvn", the dedication "Für Elise" having been added by Schachner decades later, when he made a gift of the autograph to his wife or daughter. This scenario is much more likely than the laboured theories presented by Kopitz and Steblin. All the people involved in my own scenario had direct contact with the autograph of the Bagatelle WoO 59, and on putting Occam's razor to work, the role of Elise Schachner as Daddy’s rather than Beethoven’s Elise appears quite reasonable. Following Kopitz's and Steblin's example, I should of course have immediately published my idea in the press under the headline "The solution of the mystery". Steblin is of course fully aware of my theory and its publication in my weblog on July 8th, 2013. In her summary of "Previous theories about Elise's identity" in The Musical Times, however, she chose not to mention it. The reason for her deliberate discretion is quite simple: in my 2013 article I published a photograph of the same census sheet dealing with the Theater an der Wien (Laimgrube 26/7) which Steblin claims to present for the first time on p. 8 of her article in The Musical Times. I had already found and photographed this particular document, which incidentally is completely irrelevant for the identification of an "Elise" candidate, in December 2005, and simply forgot to include it in my article in the 2011 Beethoven Studien. Because Steblin could not accept that somebody else had demonstrably found this piece of evidence seven years earlier than she did, she decided to ignore my hypothesis altogether. Dr. Steblin seems to think that her referring several times to my previous research in The Musical Times is compensation enough for her having suppressed any reference to my 2013 article; she is however mistaken.